Happy Valentine's Day! 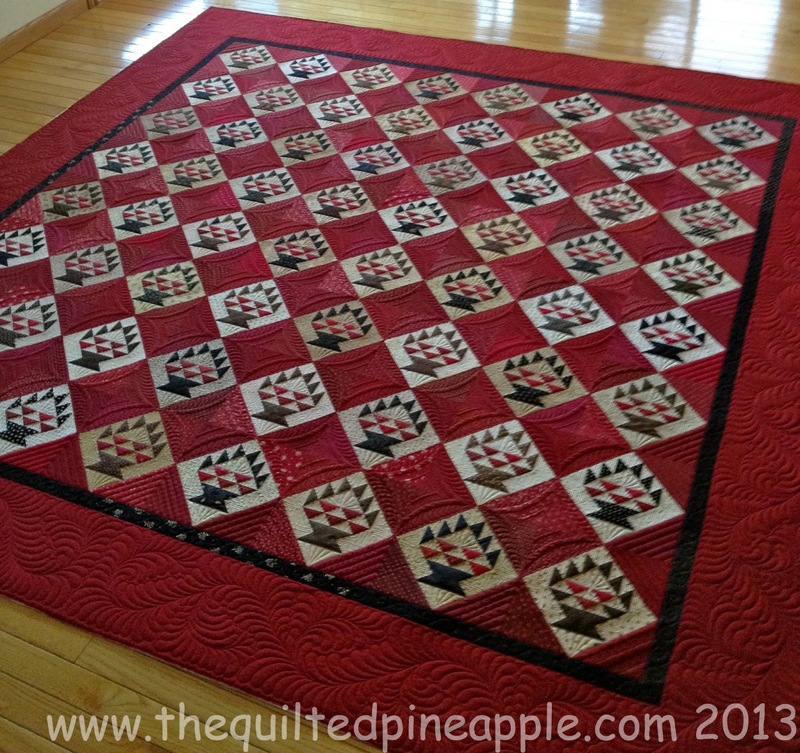 I cannot think of a better day to reveal a quilt that I LOVE!!!! A true labor of love! 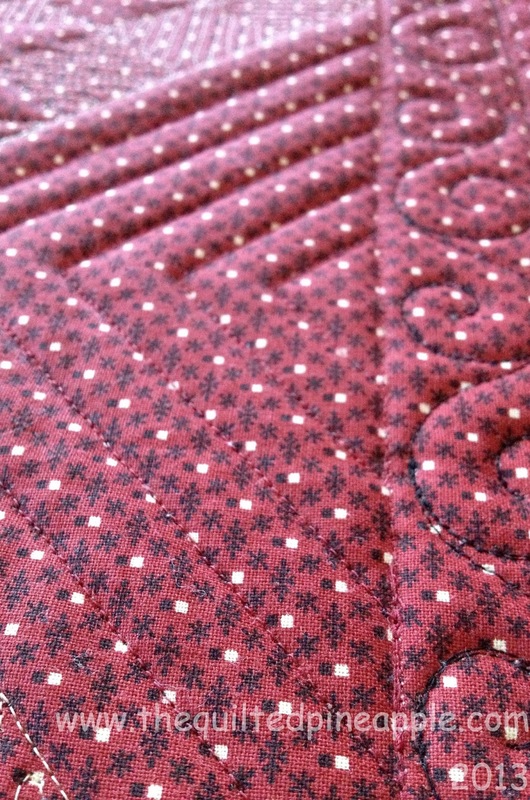 I had the pleasure of quilting another one of Thelma's - Cupcakes 'n' Daises- quilts. Thelma is an amazing quilter. 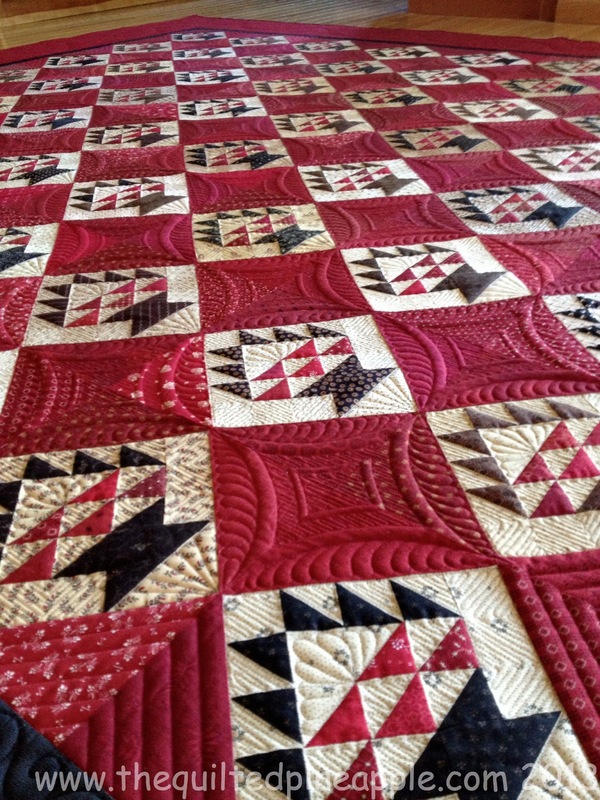 Her quilts are beautifully pieced!!! 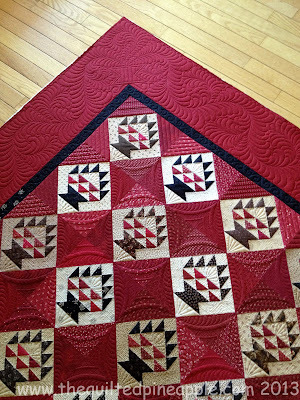 Door County Cherry Baskets is a gorgeous pattern by Lisa Bongean of Primitive Gatherings. So even when I am not quilting for Lisa...I am still quilting one of her designs!! LOL! I have LONG admired this quilt, so I was very excited when Thelma decided to send it to me!! Thelma had the patience of a saint, but I think I made it worth her wait. :-) Pull up a chair...I have quite the picture show in store for you all!! GORGEOUS! 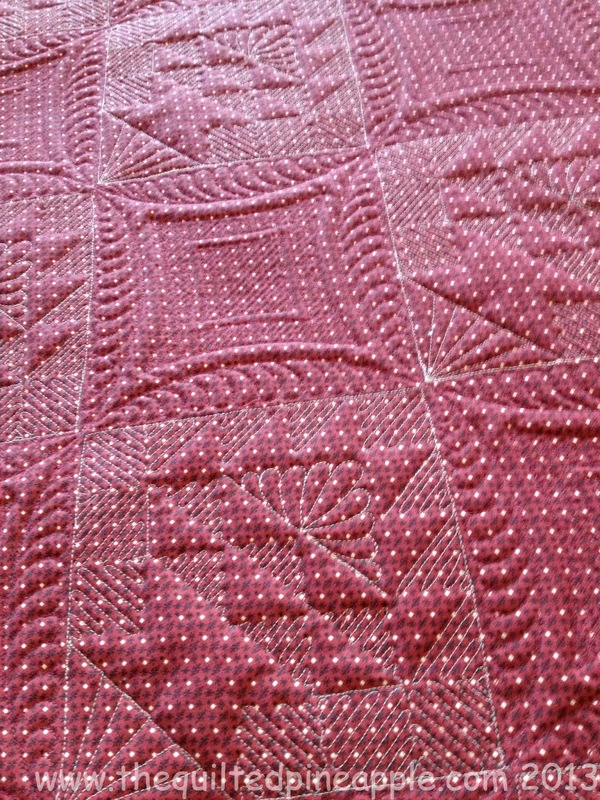 I had troubles trying to capture the whole quilt in a single photo. 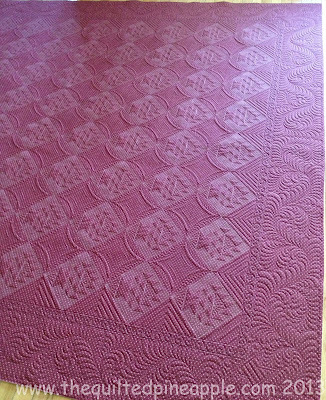 The reproduction style of the quilt encouraged me to create a design that looked like an antique. I remember telling Thelma that I had a vision for this quilt. The top border of the quilt, I decided I would re-create the basket in the blocks with feathers to create a gorgeous motif in the corners of the quilt. In the cherry basket blocks, I wanted the basket of cherries to pop and the background to stay in the background. 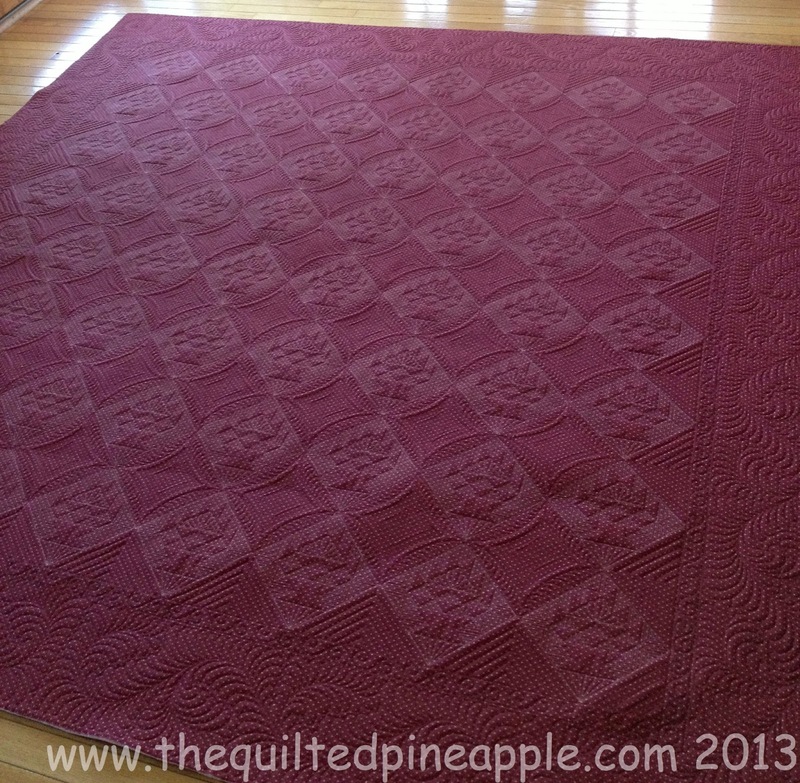 I quilted a basket weave style filler to do that. The red "squares" between the cherry basket blocks were more challenging initially for me to come up with a design. 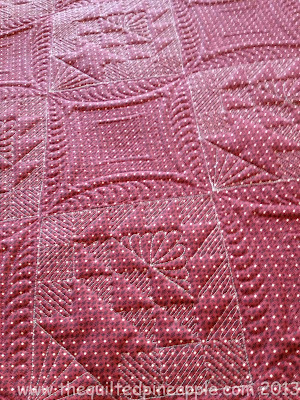 Again, I wanted to keep the quilting traditional with an antique quality. I knew I would incorporate feathers. I love how it came out! I wasn't convinced that I would carry out the design in all the blocks. 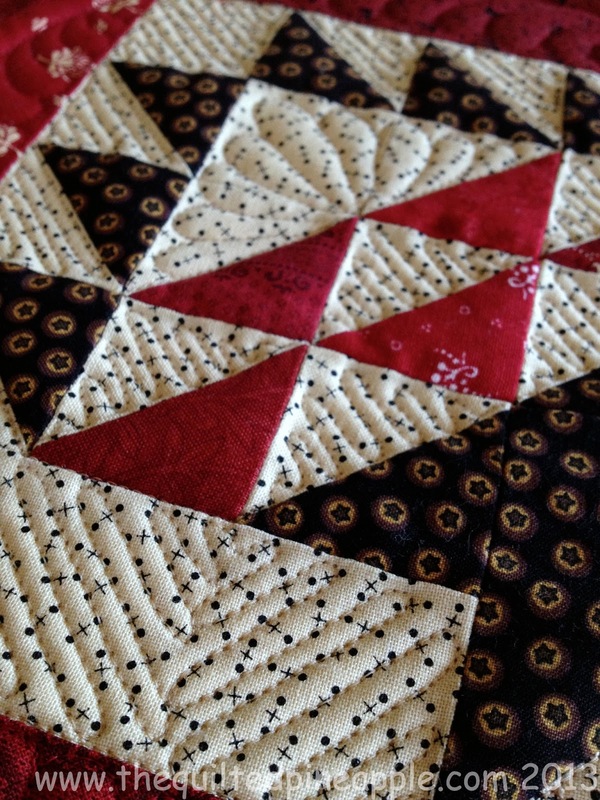 Mostly because I knew it would take a lot of time to quilt that design in each of those blocks. Was I using my time efficiently? There are A-LOT-O blocks in this quilt. 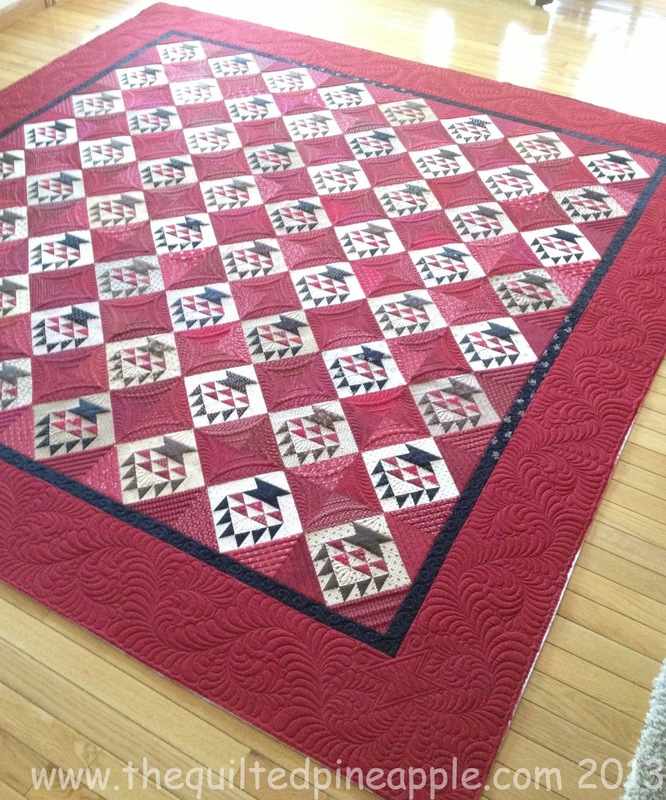 I may have mentioned that fact to LB a few times as I was quilting this. :-) Then Scott walked into my studio and went crazy for the design. He noticed that a secondary design was emerging...the circle of feathers around each cherry block. He was complimenting what a genius design it was. I confessed that I hadn't even realized it!!! When I saw it (like a slap in the face), I knew at that moment, I didn't care how long it would take me. The quilt was as it should be. The side setting triangles and corners have a simple yet striking design. And lots of feathery plumes in those borders!!! The threads and texture look amazing. The short list of specifics....double batting. Dream Blend with a layer of Dream Cotton over it. All So Fine Threads from Superior. Red, cream and black. I used my Fine Line Curved cross hatching ruler for the red blocks. I also made my own templates out of card stock for the corner motifs and feather spines. 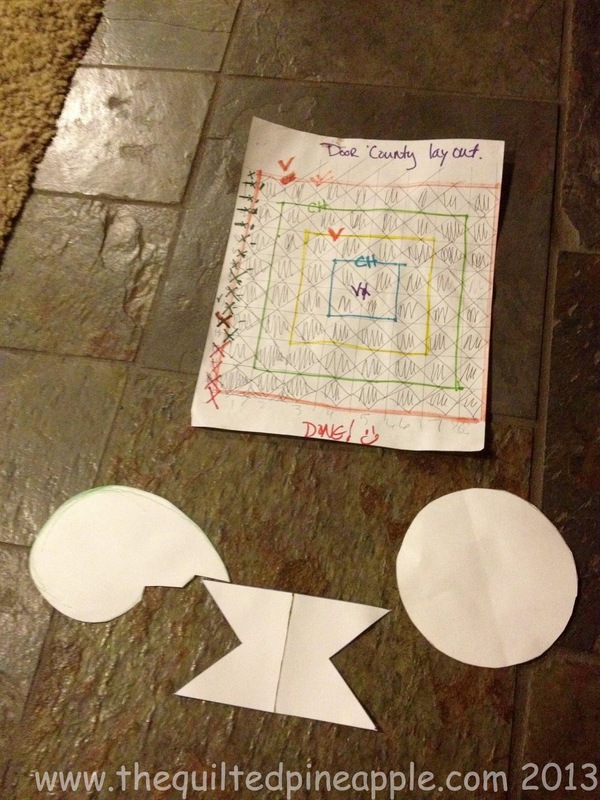 Yes, I also diagrammed a layout of the quilt. This really helped me stay on track. 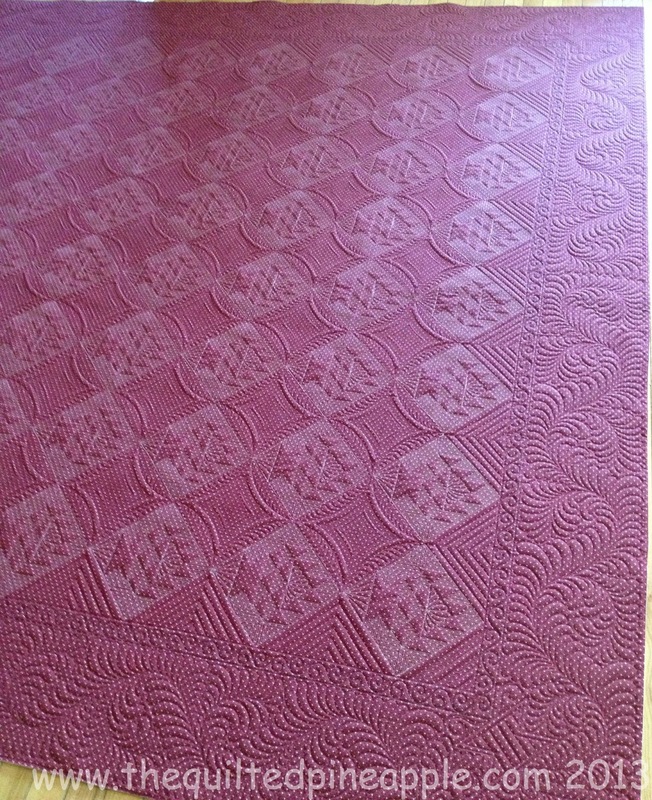 Plus, it was just plain fun to check off each row after I had quilted it!!! It was like my little reward to have it all checked off by the time I had gotten to the end! LOL!!! 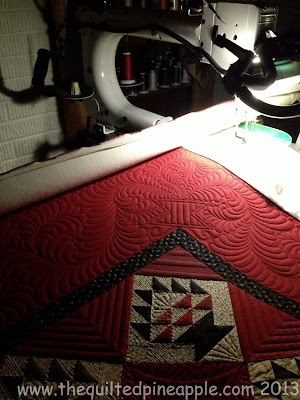 I have plenty of photos of my quilt process. I did not include them in this post. If there is enough interest, I can write a separate post documenting that. Make sure you stop by Thelma blog today and read her post here. If you are interested in Door County Cherry Baskets, it is in the book Summer Gatherings available at Primitive Gatherings here. 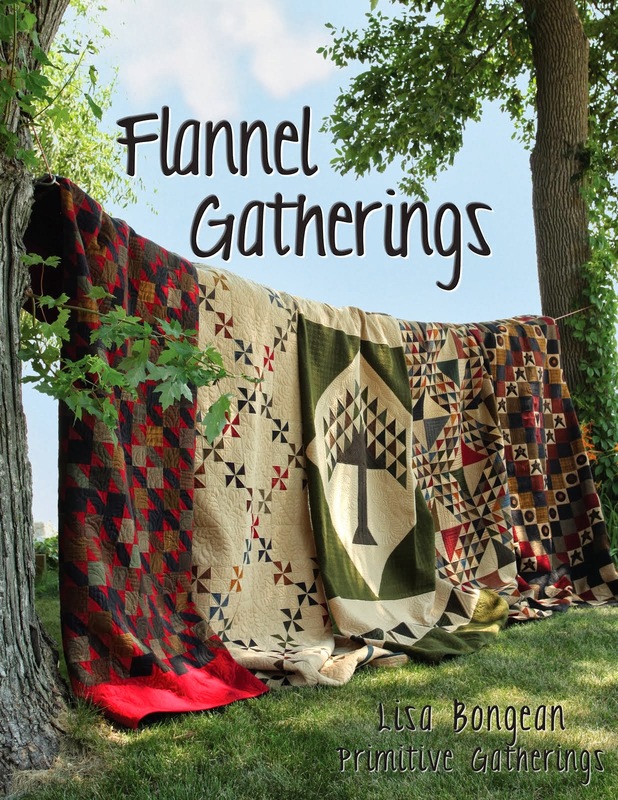 Door County is the pattern Lisa has pictured at the top of her blog. I know Thelma will cherish her quilt always. 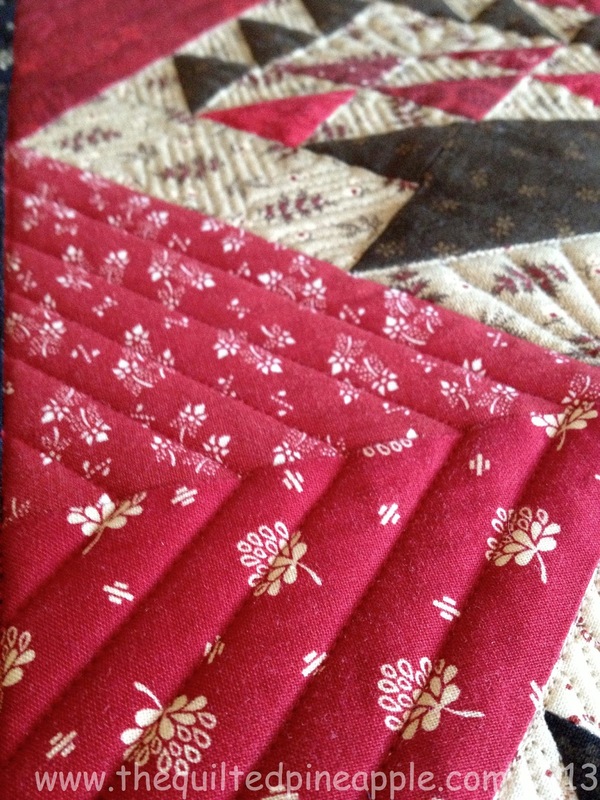 It is always nice to know how much a quilt will be loved after I send it off because a piece of me goes home with it. AWESOME! 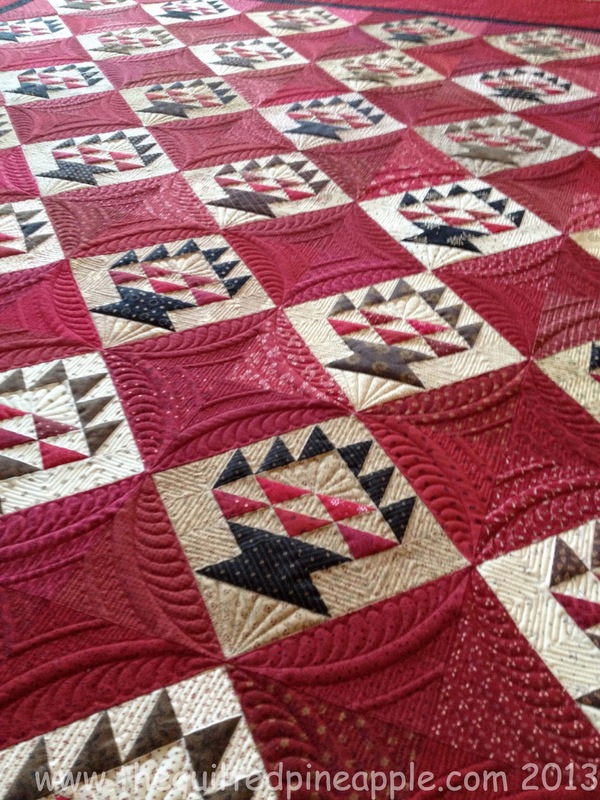 I can only hope that someday my quilting will be this Beautiful! Happy Valentines Day! 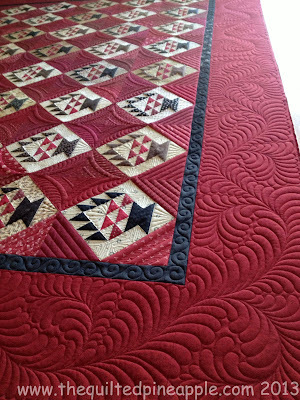 Your choice of design elements really compliment the quilt top. I can only imagine the amount of time you spent on this top. How did you come to choose the double batting instead of a wool? I am always curious about how the batting choice is made. I love the definition your choice gave to the motifs. Wow this is amazing. 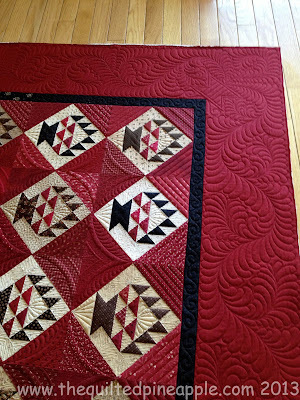 so fantastic quilting. I do love my quilt and will cherish it forever! Hey, did you know that the original patter calls for 99 blocks but I made my version smaller with 64!? You would STILL be quilting it if I followed the pattern! 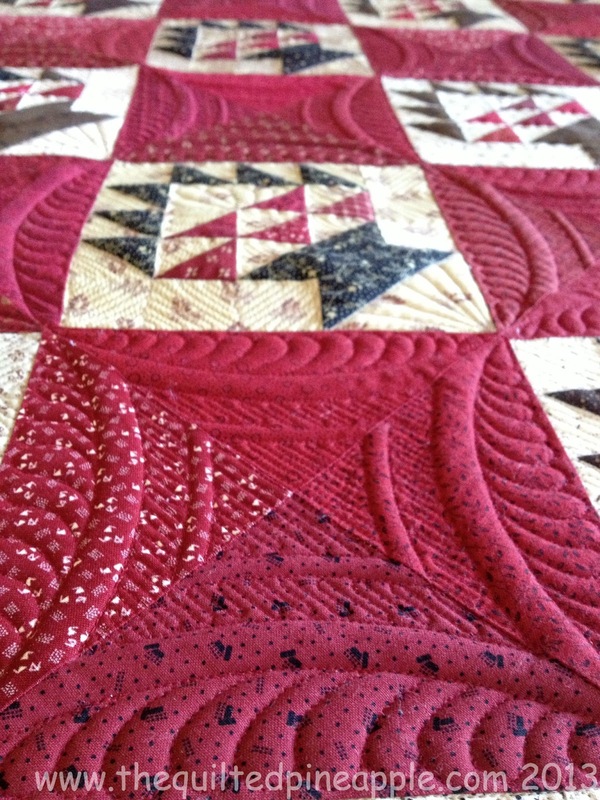 Thank you so much Linda, I could not be happier with my quilt. Your quilting is just wonderful and it looks so great on the quilt! 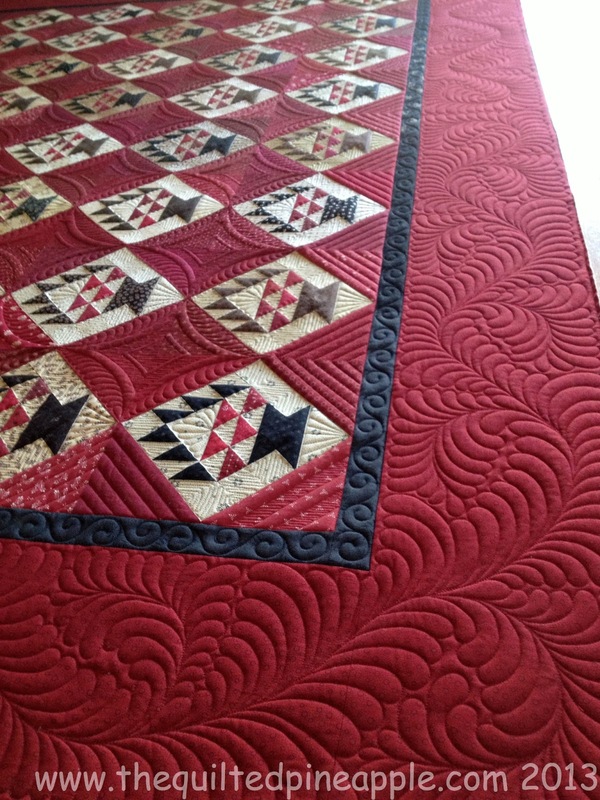 Words just can't described how beautiful the quilting is on the quilt. I am just blown away! 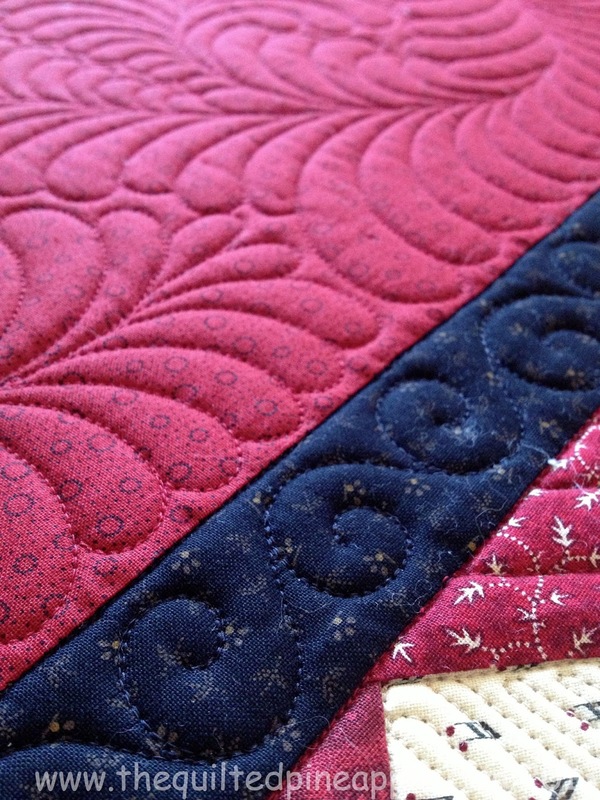 I hope you will show us your quilting process I would love to see it! Thanks so much for sharing the pictures!!!! Beautiful quilt and beautiful quilting....inspirational! Holy cow!!!! If anyone ever needs proof that a quilt can go from nice to spectacular with the quilting, this is it! It's just amazing. 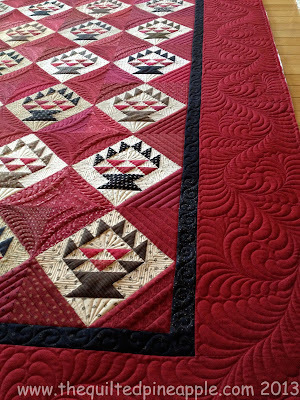 Words can not describe just how beautiful this quilt is. Awesome job! It's impolite to drool and I've run out of superlatives to describe your stunning work. The mister has a well-trained eye. :o) I heart baskets and your feathers. Absolutely amazing! Wow!! Would love to see what you're working on! Awesome! Have you entered any contest? Oh what a lovely quilt! 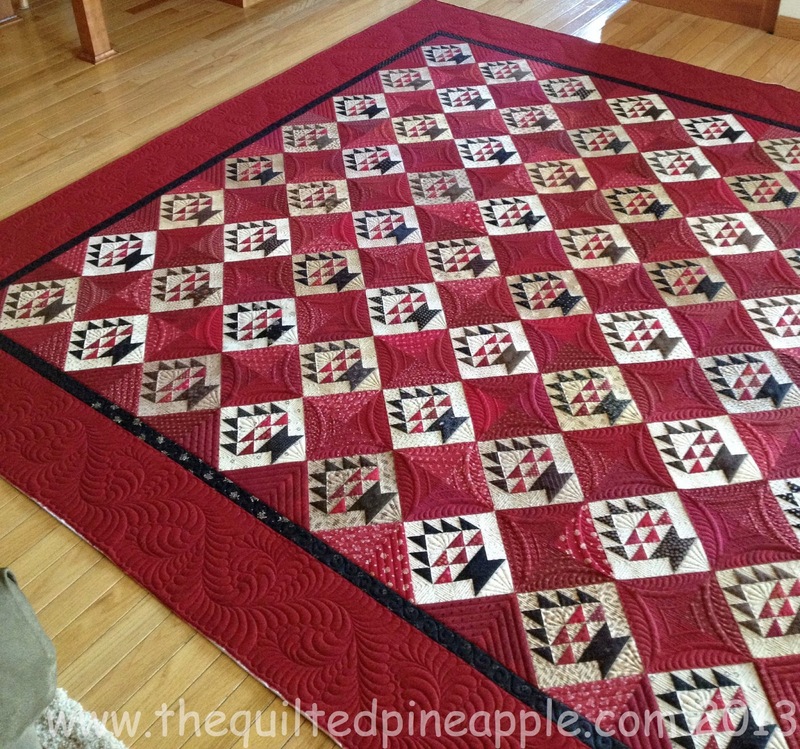 Both the piecing and the quilting are truly gorgeous! Wow, fantastic, truly a work of art! 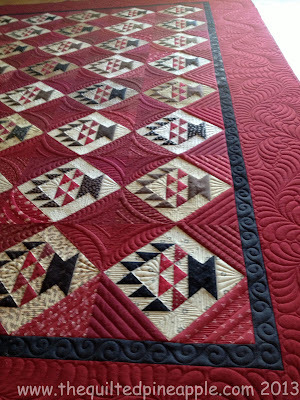 omg words can not convey how beautiful the quilting is on this quilt. Between the two of you (Thelma) this is a winner hands down. Oh my goodness that is just amazingly amazing if I can make up words. I just love this. Where do you get your rulers? Wow that had to have taken you forever! Again amazingly amazing! Stunningly gorgeous. Both YOU and THELMA do fabulous work. I enjoy every photo. This is quite an achievement and an inspiration! I've never seen such amazing quilting. It is exquisite. The piecing is great... and the quilting is so beautiful that I can't stop staring at it. I second what every single person said. Your talent just amazes me. Oh boy, oh boy, oh boy, what I can I say about this...? It is so stunningly beautiful and so very well executed! Both of your work is lovely and I think your quilting is second to none. I keep on looking at it. Oh boy, oh boy, oh boy.. Absolutely STUNNING! Did I mention red is my favorite color? 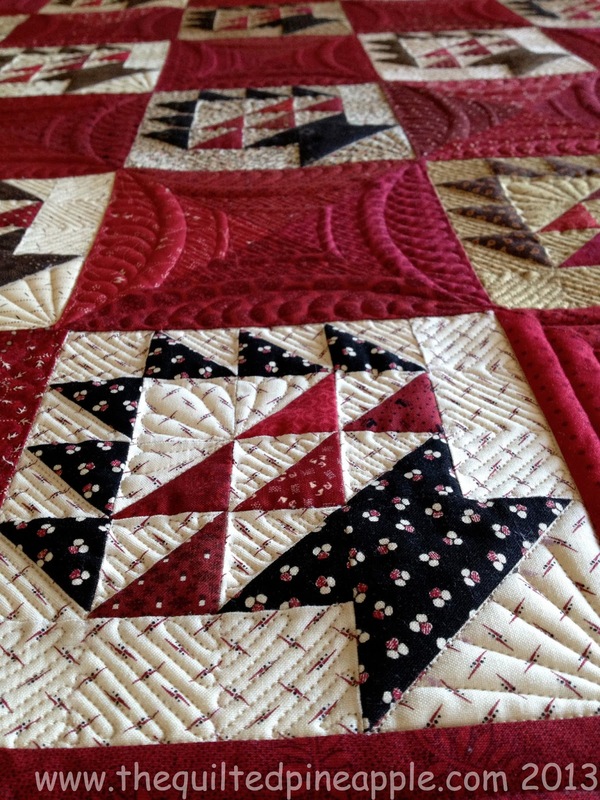 Love the baskets she pieced and your amazing quilting absolutely makes this quilt sing! Wow! I think I'm speechless!!! Oh my gosh! That is just gorgeous! 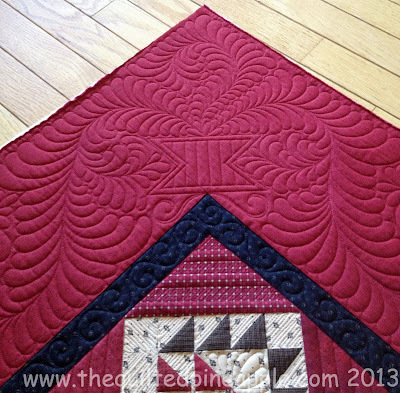 The piecing, the quilting!! You do such amazing work, Linda. It's definitely something for all of us to drool over. You are such an artist! Linda, this turned out fantastic. Your feathers are just gorgeous. You really have a great talent! Wow, the back says a statement all on its own. Okay, now "THIS" one is truly a work of art. So beautiful! You must be very proud! 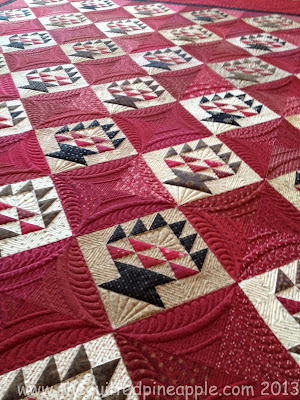 Amazing quilting. I am so amazed you freehand all of this! How long did this take you to quilt overall? As usual--spectacular!! I love love to see the entire process--your talent amazes me! You and Thelma are two peas in a pod-Extraordinary Artists!!!!! Trying to think of something different (than the other comments) to say about Thelma's quilt and your quilting, but I can't seem to. Your pictures of the quilt and your quilting are just amazing. I would love to read more about the process you went through. Please share more!! Thank you for sharing your photos. 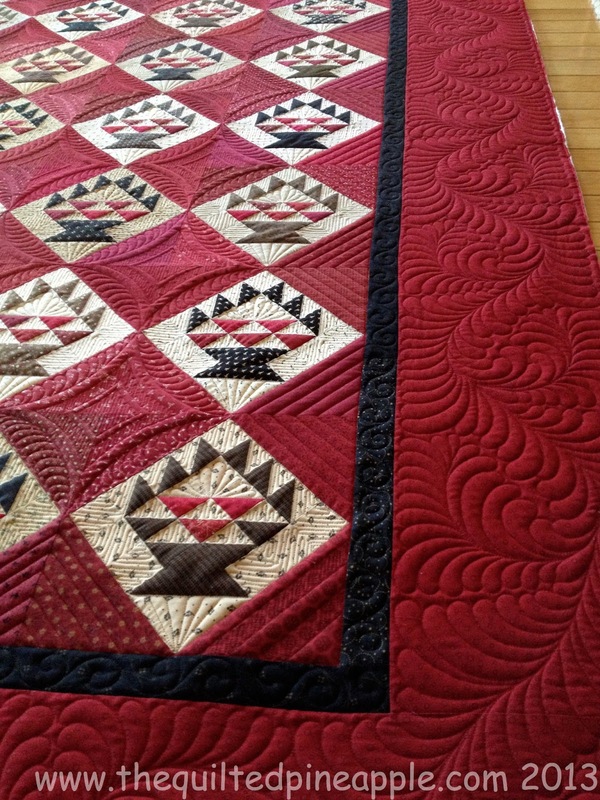 I would love to read more about your whole process in planning and quilting this quilt. 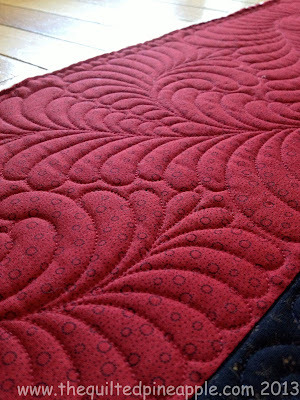 I especially like the rings that are formed around the baskets from the arcs that you quilted in the red spaces. wonderful!!! I agree with everyone else. I am speechless! 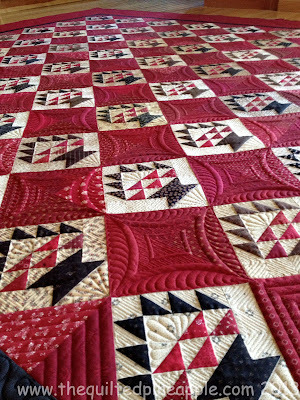 That is such a beautiful quilt, love the design, love the colors and I love how you quilted it, the designs are perfect. 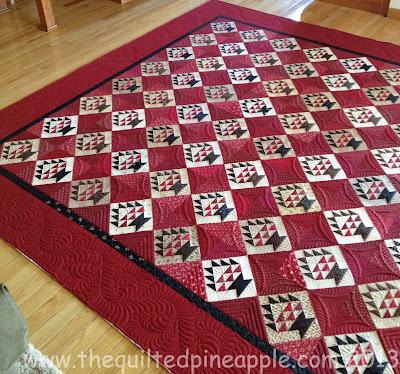 Love what you did on the quilt, it's just perfect! Absolutely beautiful! There's not one little thing you could have done differently. It could not be better. Truly stunning workmanship! Outstanding and gorgeous! You do incredible work! 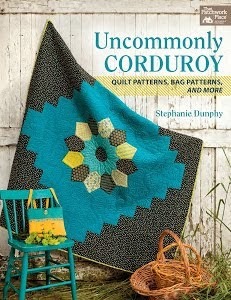 This is just stunningly beautiful, and the secondary pattern is a wonderful surprise. 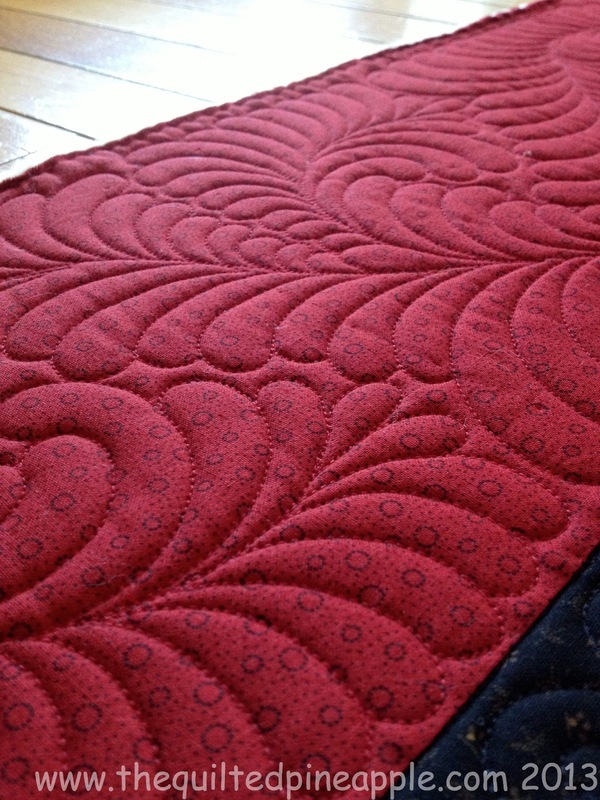 I know that Thelma appreciates the quilting. Oh my goodness . . . that is amazingly gorgeous!! What wonderful work you do!! WOW! that is a beautiful quilt made absolutely striking with the quilting! 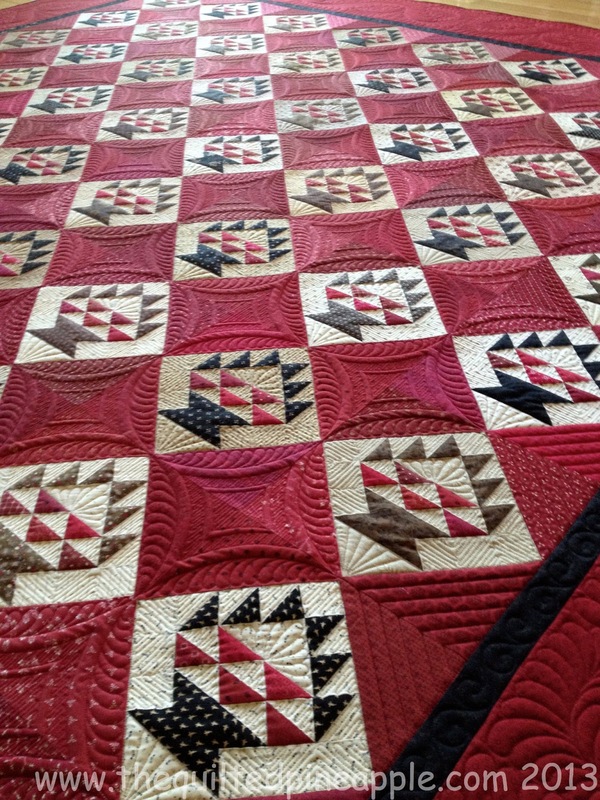 You did a phenomenal job in the quilting! What else can be said that hasn't already been expressed. It is "Over The Moon" brilliantly quilted. Congrats to you both for a job well done. You've shown us some beautiful work of yours before, but this is just the tops. Absolutely gorgeously beautiful. Truly remarkable. 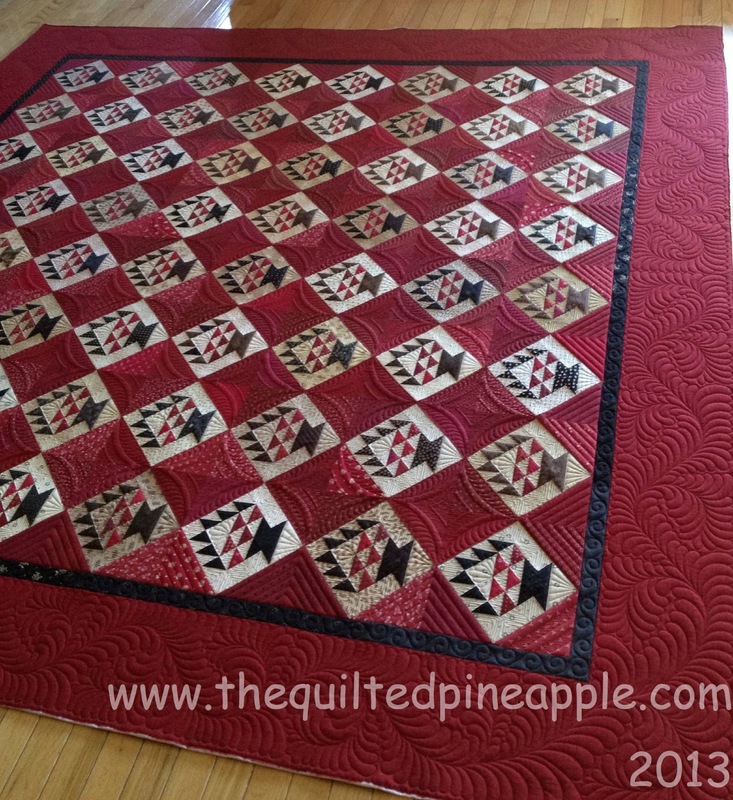 This should be an award-winning quilt, both for her piecing and for your quilting. Absolutely stunning. The first thing I saw was the circles around the baskets. Your vision for the baskets in the corners was genius! Once again, I bow to you. Wow! 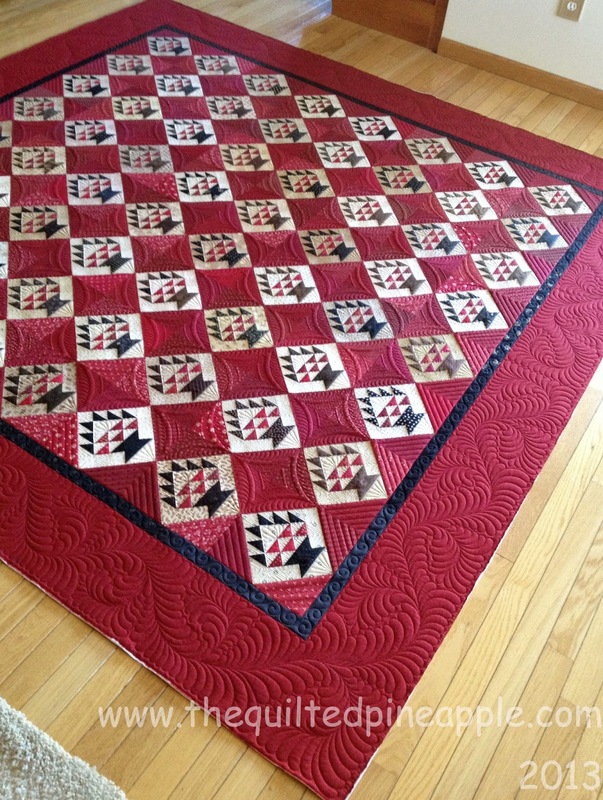 You did an amazing job on the quilting. It just brings the whole thing to life. I would love to see your "in progress" photos, especially the quilting in the red. Tutorial, please! My goodness, simply stunning! 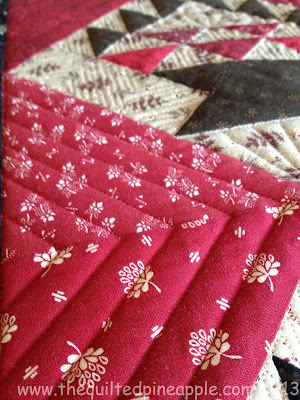 I would love to have you quilt one of my quilts...how can I do that? You are amazingly talented!!! Wow wow wow. Simply breath- taking! Would you quilt a quilt for me? I don't think I could add one more thing, it is so stunning. Can you give a new longarmer a hint on how to start doing feathering. I am really interested in learning but don't know where to start. All I can say is I want your quilting brain cloned for me, Linda! Totally awesome! A friend from my quilt bee group told us to check you out. I did and I am so amazed by your talent. So consider me your newest fan! I appreciate all of the information you generously share. 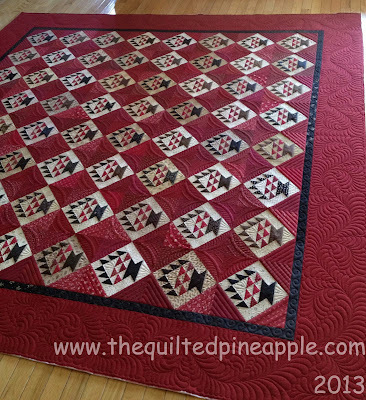 All of your quilts are awesome but Door County Cherry Baskets is my favorite and I would love to hear more about it. You are such an inspiration! !